Hello, and welcome to classic2strokesuzuki.com, the website home of Titan Performance, a site dedicated to the 500 Suzuki two stroke. Titan Performance is the partnership of two men, both now the wrong side of half a century, who are still very enthusiastic about the two strokes they rode in their youth. We have an extensive motorcycling experience between us, as we started on bikes young, and have owned literally dozens of different bikes over the years. However, while the others came and went, the suzuki 500s stayed, and we have owned two of our bikes since 1977, now that's loyalty ! 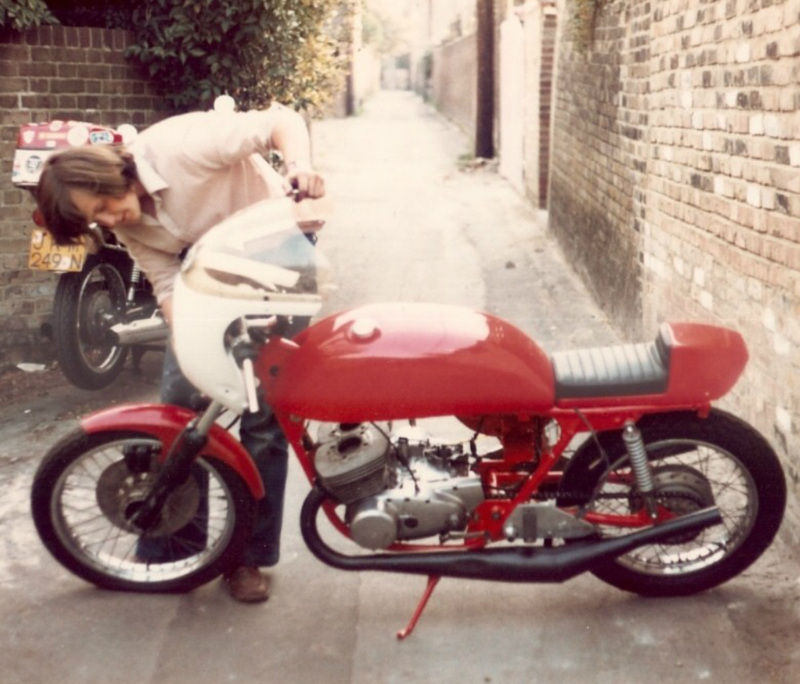 This is 1978, and my first 500 cafe build takes shape. My stock 500M is in the back ground. I still have both of these bikes today ! 32 years later, both bike and rider have changed somewhat over the years. Something about this model made us want to keep them. They are not the prettiest, quickest, or most economical, but the character of the 500 twin has generated a large number of loyal followers, who will hopefully enjoy a visit to this website. You never know, we might also convert some new boys, when they see what can be done with an old 500 stroker. Over the years, we have built, and rebuilt many bikes, and it was the difficulty in obtaining some of the 40 year old components, that prompted us to manufacture our own. 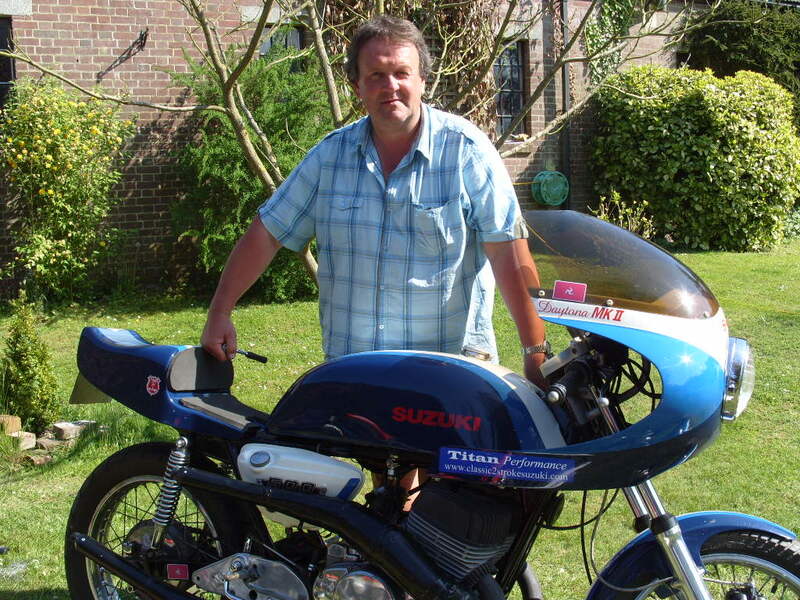 In 2005, Tim, built his Frank Whiteway tribute bike, which he based closely on the early 70s, Crooks suzuki production racer, ridden to victory on the Isle of Man, by the heroic Mr. Whiteway. 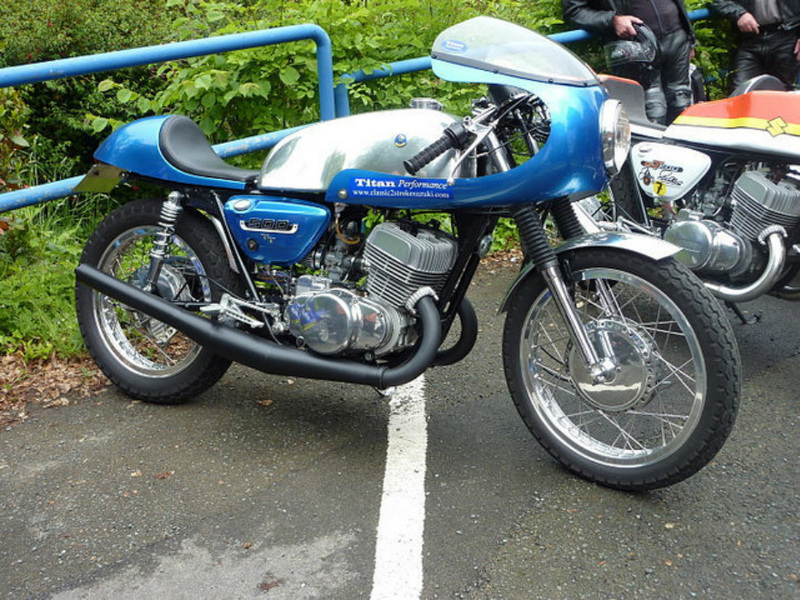 Those of you who buy Classic Bikes magazine, or visited the London Excel motorcycle show in 2010, will have seen Tim's superb 73 500 feature in the "Classic bike of the year" competition. 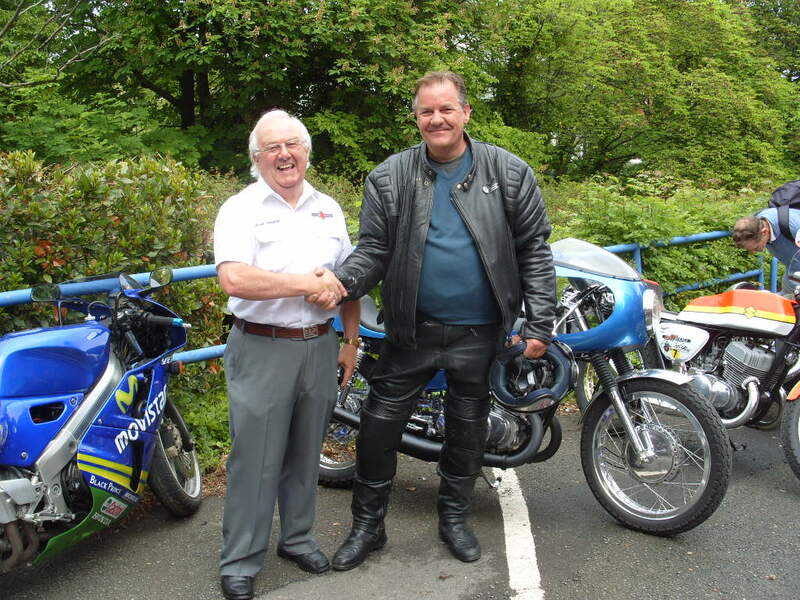 Tim and his 500, pictured with Frank Whiteway in 2010. This shot was taken outside the Manx museum in Douglas, Isle of Man, at the opening of Suzuki's 50 years at the TT exhibition. 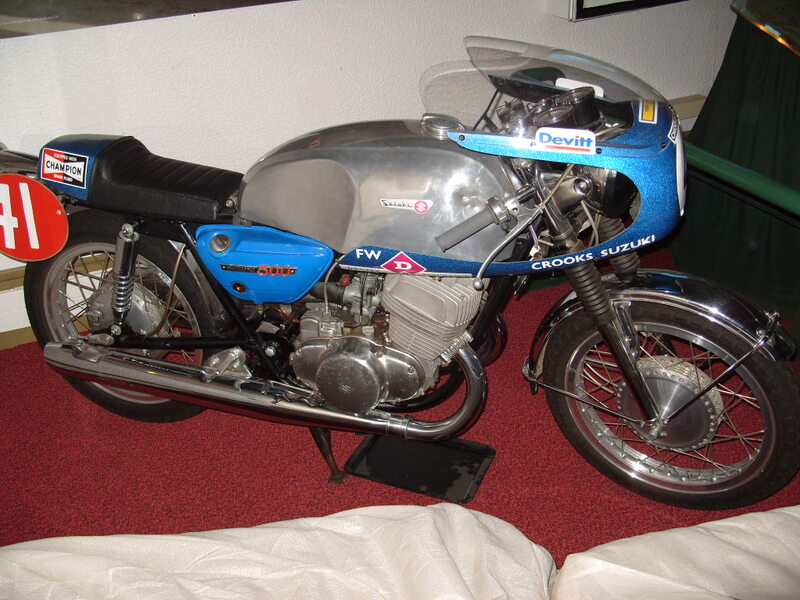 This is the original 500 ridden to production race victory by Frank, back in 1970, on display at the Manx museum. Tim's cafe racer, the similarity is clear. We hope you find the site of interest, and we would be very pleased to hear from you if you have a 500 special that we could feature in our picture gallery. If you don't find what you are looking for here, please contact us on, titan.performance@yahoo.com and we will do our best to help. We are always pleased to hear from fellow enthusiasts.